Too many development initiatives have limited impact. Schools are built but children do not learn. Clinics are built but sickness persists. Governments adopt reforms but too little changes for their citizens. 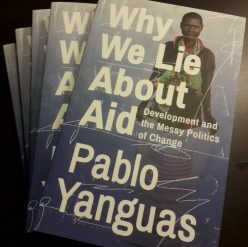 This is because genuine development progress is complex: solutions are not simple or obvious, those who would benefit most lack power, those who can make a difference are disengaged and political barriers are too often overlooked. Many development initiatives fail to address this complexity, promoting irrelevant interventions that will have little impact. Some development initiatives, however, have real results. Some are driven domestically while others receive external support. They usually involve many players – governments, civil society, international agencies and the private sector – working together to deliver real progress in complex situations and despite strong resistance. In practice, successful initiatives reflect common principles. As an emerging community of development practitioners and observers, we believe that development initiatives can – and must – have greater impact. We pledge to apply these principles in our own efforts to pursue, promote and facilitate development progress, to document new approaches, to spell out their practical implications and to foster their refinement and wider adoption. We want to expand our community to include those already working in this way. Posted on 8 April 2014 4 April 2014 Categories Development, MoviesTags Governance, Marx Bros.